The whole morning I monitored EA2TZ/B in IN93BF on 1296.854 MHz over a distance of 1072 km, peaking up to 30 dB. The vertical profiles of 0:00 UTC from Paris and Bordeux showed an inversion at 1000 m altitude. F6DKW from Paris was booming here, but nothing could be heard of beacons close to the path or in tests with F6CIS, IN94WL and F6AJW, IN93EK. The duct was just too high. Tonight Paolo, IK7UXW, JN80XP, asked me in the KST chat, to give it another try. We had discussed the possibility of combined propagation with aircraft scatter and tropospheric ducting before. The path is perfect, as there is one hop over the Alps and a plain track over the Adriatic Sea. 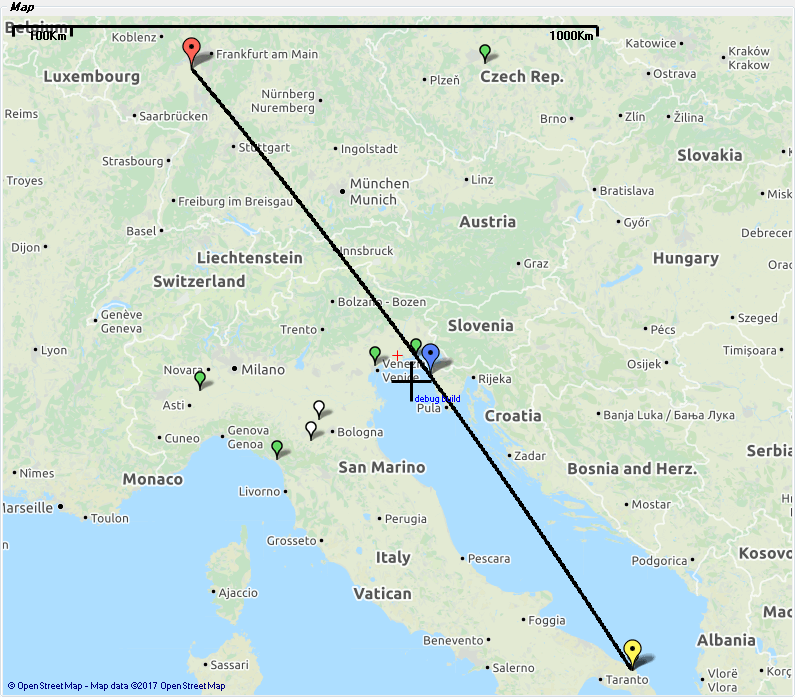 On Tuesday last week, while I was watching the other Paolo aboard the International Space Station via HAMTV on 13 cm, Paolo had initial QSOs in this propagation mode with Daniel, DL3IAE, in JN49DG on 23 and 13 cm. That was a great effort! So I was more than poised for a try. Paolo has a 2 m dish and QRO, so he started calling me in CW. I heard “musical noise”, EMEers know, what I mean, with very strong bursts from time to time, lasting for some seconds. After a while we decided to try in JT65c. And from the start I could decode Paolo in most of the periods. 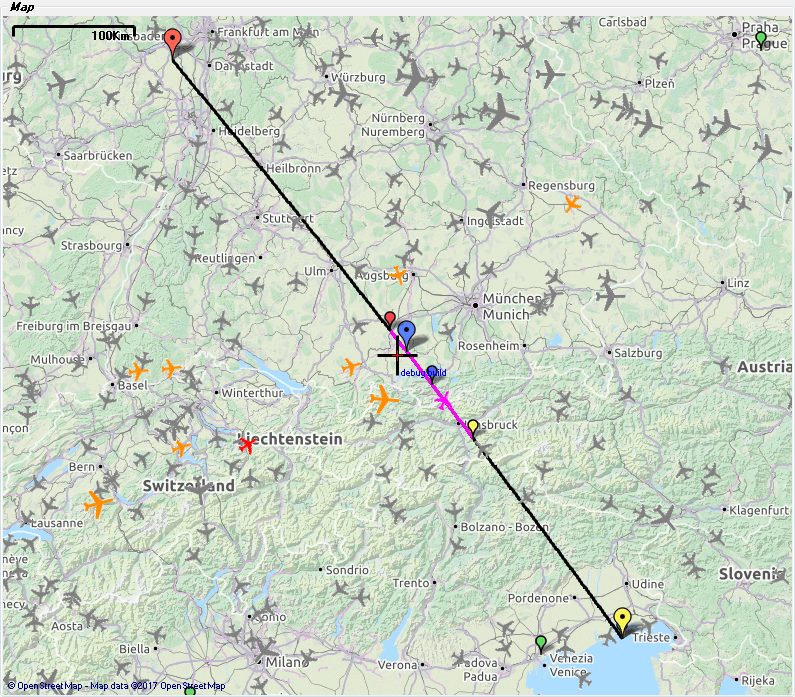 The better decodes always correlated with airplanes, crossing the path within a specific window soutwest of Munich defined by a path with a virtual end at the coast of the Adriatic Sea. The whole Test took almost an hour to complete, as my TX power is about 10 dB less than Paolos. It is evident that JT65 with 60 second periods is not very useful. Paolos reference for ducting on the Adriatic Sea is IQ3ZB/B. Tonight it was at S9 + 30 dB. With good conditions it can be at S9 + 60 dB. So we agreed in continuing the tests in other digital modes and in CW as well as on 13 cm. This entry was posted in Aircraft Scatter, Propagation, Tropo and tagged 1296 MHz, 23 cm, Aircraft scatter, Beacon, EA2TZ/B, IK7UXW, Inversion, JT65C, Sea Ducting, Tropo, WSJT on 2017-08-17 by admin.